If ever a picture was worth a thousand words, it was the image of General MacArthur and Emperor Hirohito standing side by side during their historic first meeting on September 27, 1945. In it, a casually dressed MacArthur towers over the stiff, formally attired Emperor. "What does it say?" asks historian Carol Gluck. "It says, I'm MacArthur, Supreme Commander of the Allied Powers, and I'm in charge." For millions of Japanese, it brought home in an entirely new way the notion that they had lost the war. Emperor Hirohito, 1945. Library of Congress. The man known as Tenno to his subjects and Hirohito to the rest of the world ranks as one of the most enigmatic figures of the 20th century. The ambiguity surrounding his role in leading Japan to war makes simple judgments of him all but impossible. And the cultural barriers may be even more formidable than the factual ones: to many of his subjects, the "emperor of heaven" was not really a man at all, but the living embodiment of the Japanese people. Whatever one's perspective, his life offers a powerful lens through which to view Japan's tumultuous history in this century. Installed as Crown Prince at the age of fifteen, Hirohito assumed the "Chrysanthemum Throne" in 1926 with the death of his father, the Emperor Yoshihito (now known as the Taisho Emperor; with his death, Hirohito's reign took the name Showa). Because his father had been a weak and sickly man, Hirohito ruled more in the shadow of his grandfather, the great Emperor Meiji , who presided over Japan's late-19th-century opening up to the West. Even before he assumed the throne, Hirohito reflected the same fascination with the West, particularly after a six-month tour of Europe in 1921, where he picked up a life-long taste for Western food and clothes. This is the Hirohito the world also saw in 1975, when he finally realized his dream of visiting the United States, where he met John Wayne, was received by President Ford, and acquired a Mickey Mouse watch he wore for years. In between, however, he presided over one of the largest and most costly military ventures in human history. In the decades after the war, the accepted version of events held that Hirohito was essentially a pawn of the militarists who gained control of the government shortly after he took the throne. MacArthur, convinced he needed the Emperor to run a smooth occupation, played no small part in establishing this version. With Hirohito's quiet manner, love of haiku and marine biology, the image of the peace-loving man who was powerless to stop his country's murderous expansion took hold. But in the decade since his death, a more open inquiry into what happened has convinced a number of historians that this version, while partially true, is far from accurate. 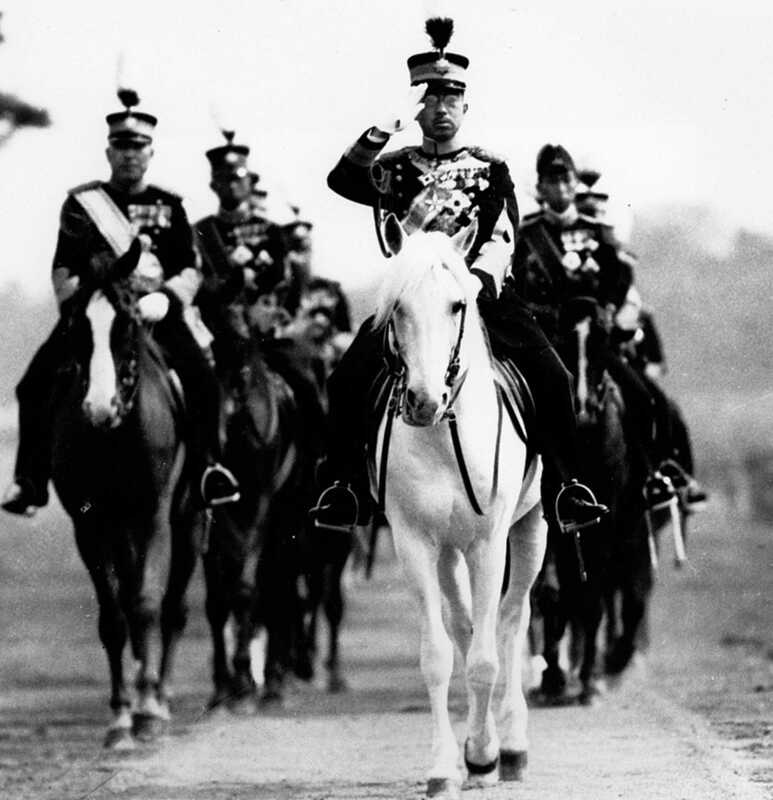 Hirohito's ability to thwart the militarists was certainly limited -- he was more a symbol of the state than an actual ruler -- but he was not nearly as blameless as his defenders would have it. 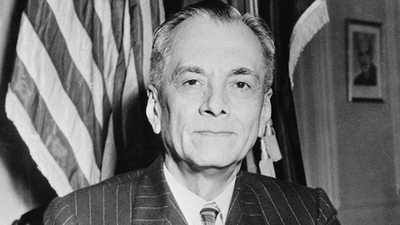 The occupation official and historian Richard B. Finn sums it up this way: "The decisions that led to the war in 1941 were made unanimously by the cabinet, the emperor was fully informed about them, they were often made in his presence, he knew in advance of the plan to attack Hawaii, and he even made suggestions about how to carry it out." On August 15, 1945, the Japanese people heard the voice of their emperor for the first time, and while he avoided using the word "surrender," his meaning was clear. Although "the voice of the crane" was heard far too late -- Japan had lost 2.3 million soldiers and 800,000 civilians in the war -- in the difficult days ahead the emperor did provide a much-needed measure of national unity. 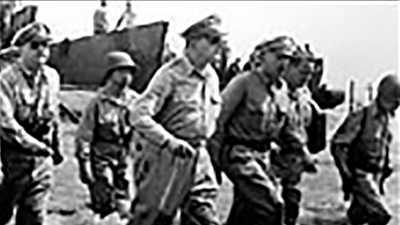 Accepting MacArthur's implicit bargain -- help me and I'll keep you from being tried as a war criminal -- Hirohito did his part to remake Japan along an American model, backing the new constitution, "renouncing" his divinity, and trying gamely to play the part of "Japan's first democrat." By the time his 62-year reign came to an end, Japan had risen like a Phoenix out of the postwar rubble to become one of the world's richest countries. It was in demonstrating this remarkable capacity for change that Hirohito truly became the living symbol of his people. According to historian Michael Schaller, Japanese foreign minister Yoshida Shigeru commented at the outset of the occupation that by being "good losers," his people might regain in peace much of what they had lost in the war. More than fifty years later, it's clear that Yoshida's prediction was right on target, and his able leadership in those early years went a long way toward making it happen. In a number of ways, Yoshida Shigeru was an unlikely candidate to lead his country out of the postwar rubble. Barely five feet tall and chubby, he possessed a sharp wit and willingness to express strong personal opinions which set him apart from most Japanese, particularly other bureaucrats. In fact, his public life seemed to be over when he retired in 1939, having fallen out of favor with the government for his anti-militarism; he was also imprisoned late in the war for the same reason. But on the very day MacArthur established his headquarters at the Dai Ichi Building in Tokyo, Yoshida was summoned to the capital to join the new Japanese cabinet as foreign minister. He would serve ably in that capacity until called to be prime minister in the spring of 1946, and would hold that post for most of the occupation period. The unconventional little career diplomat had become the most important man in the Japanese government. Yoshida, whose mother was rumored to be a geisha, had been adopted by a childless Yokohama merchant and his wife, who provided him with a good education and a sizeable inheritance. After attending the elite Tokyo Imperial University, Yoshida married into a prominent family. Historian Richard Finn writes, "Yoshida lived the first thirty-five years of his life in the reign of the Emperor Meiji and had many of the characteristics attributed to the leaders of that era..., such as education in the Chinese classics, patriotic pride, loyalty to the throne, and, in many cases, a broad international outlook." This background served Yoshida well in his diplomatic career, which included posts in China and Italy before he became Ambassador to England in 1936. According to Finn, "in London he developed considerable admiration for the British political system, with its parliamentary politics and combination of aristocratic and democratic traditions." Along with his quaint but very understandable English, such attitudes made Yoshida a natural choice to deal with the Americans after the war. The first meeting between Yoshida and MacArthur was telling. Yoshida later revealed to his daughter that the American paced theatrically back and forth while delivering one of his sekkyo, or sermons, prompting Yoshida to laugh, as he imagined being caged with a pacing lion. MacArthur asked what was so funny, Yoshida told him, and MacArthur glared for a moment before laughing along with his guest. The ice broken, the two established a good working relationship, and met many times in the coming years. Yoshida's politics were essentially conservative. Early in the occupation, he helped arrange the emperor's historic first visit with MacArthur, and worked diligently to protect the throne. Convinced that democracy would take time and economic prosperity to develop, Yoshida tried to soften or delay many of the liberal SCAP reforms, which MacArthur did not fail to notice. This was particularly true during Yoshida's first premiership, from the spring of 1946 through the spring of 1947, when the Socialists gained enough seats to control the government. But in 1948 Yoshida's newly formed Democratic-Liberal (but actually quite conservative) party defeated the Socialist-led coalition, and his cabinet remained in power well past the end of the occupation. The second time around, Yoshida found MacArthur more accomodating, as the "Reverse Course" in American occupation policy had begun to favor the old industrial and bureaucratic elites, who offered the quickest route to economic stability for Japan. By setting the course for Japan in these crucial postwar years, Yoshida became one of the fathers of modern Japan: his Democratic-Liberal successors would dominate Japanese politics into the 1990s. 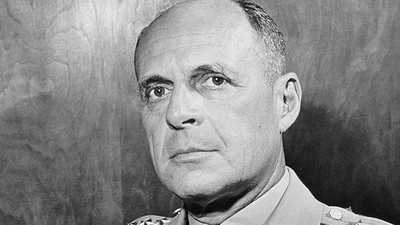 General MacArthur had known and thought highly of Ridgway since the early 1920s, when he placed the young captain in charge of physical education at West Point.